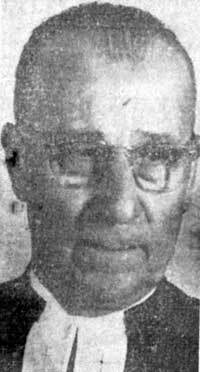 Reverend John Conrad (J.C.) Bitter was born in the Volga German colony of Lauwe, Russia on March 21, 1879. In his youth he worked on the family farm. The German colonies had their own primary schools, and most of the children had only a third grade education. To go farther in school, one had to learn Russian. J.C. Bitter did that. When he enlisted or was conscripted into the Czar's Cavalry, his education and knowledge of Russian paid off, and he rose to the highest non-commissioned rank, comparable to our Master Sergeant. He served in the cavalry for about 5 years. Rev. J.C. 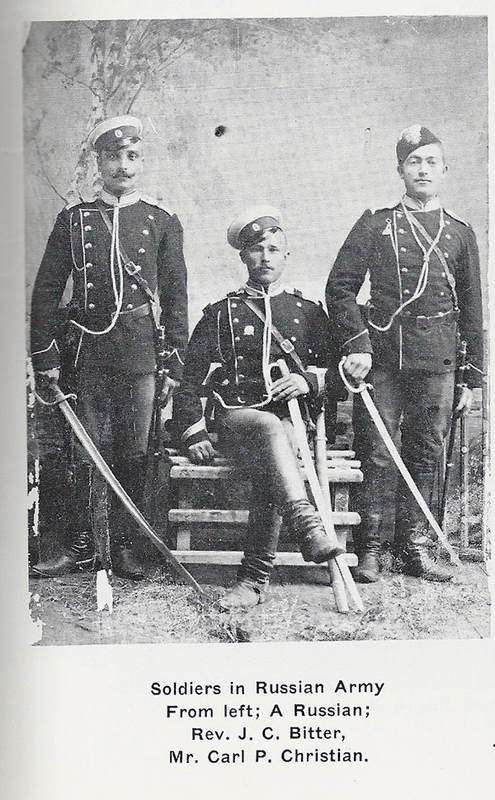 Bitter during his service in the Russian Army. Photograph courtesy of Harvey Gilliland. J.C. Bitter and Katherine Elizabeth Bitter (of a different Bitter family) were married on November 2, 1899. She had also been born in Lauwe, on November 26, 1878. About 1905, J.C. Bitter came to the United States with his wife Katherine and two daughters. They later would add five more children to their family. 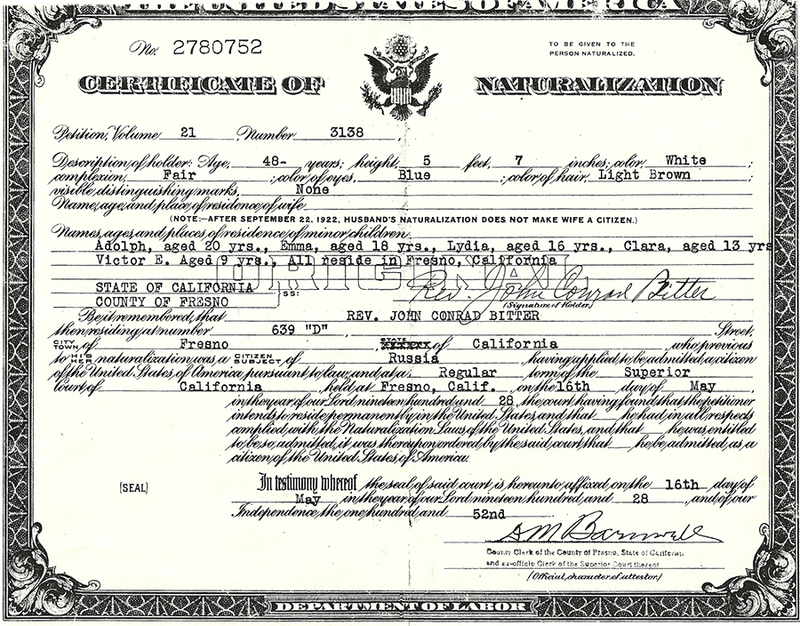 Certificate of Naturalization for Rev. John Conrad Bitter courtesy of Harvey Gilliland. J.C. 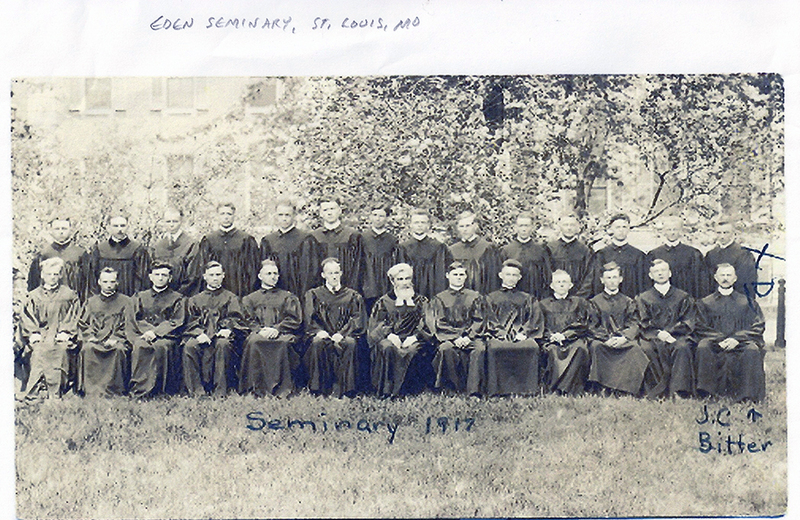 Bitter attended the Redfield College in Redfield, South Dakota from 1912 to 1914 and transferred to the Chicago Theological Seminary in 1915 and to the Eden Seminary in St. Louis, Missouri in 1916 where he was ordained by the Evangelical Church on May 27, 1917. Rev. Bitters' class at Eden Seminary in St. Louis. Photograph courtesy of Harvey Gilliland. Rev. Bitter's first pastorate was at St. Pauls Evangelical Church, Okeene, Oklahoma and was there for 4 and 1/2 years. In 1921, Rev. Bitter moved to Portland, Oregon where he served the St. Pauls Evangelical and Reformed Church after the death of Rev. Jacob Hergert. Rev. Bitter served in Portland for approximately 18 months and presided over the 1922 confirmation class at St. Pauls before accepting a call to the Wartburg Lutheran Church in Fresno, California in October 1923. Virtually all of John C. Bitter's sermons at the Wartburg Lutheran Church were presented in the German language. Only in the last few years did he preach one Sunday each month in English. In addition to his regular ministry, he translated documents from Russian into English for some of his parishioners. He and his family cared for the property of neighborhood Japanese people who were sent off to internment camps during world war two. During the Depression, when many members of his congregation were working for low salaries and or were unemployed, Rev. Bitter volunteered to have his salary cut in order that he might continue his work. Rev. Bitter served as a pastor at the Wartburg Lutheran Church for 30 years before retiring in June 1953 at age 74. The Wartburg Lutheran Church was demolished with the construction of Interstate 5 through Fresno, just a short time after Rev. Bitter's passing on January 13, 1955. Katherine Bitter died in Fresno, California on March 28, 1973. Rev. Bitter near the time of his retirement in 1953. Article from a Fresno, California newspaper. Date and page number unknown.